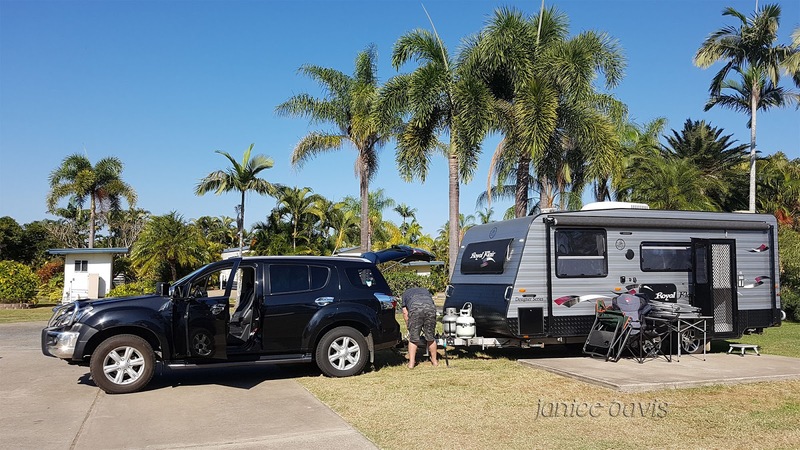 It's most unusal to see a bonsai in a public place let alone a caravan park, this one was in Rockhampton, Queensland. Though it's not small in stature it's shaped like a bonsai would be. Rockhampton in Winter is usually not warm enough but this past year in winter it was warmer than usual so we stayed longer. The bonsai looks great but the palms look even more impressive! Yes the palms do look good ones. I love bonsai, too. Especially, pine ones. It is a nice one Sussi - they are people's works of art, as they see things. They look even better in a small pot. These larger 'cloud cut' trees done in a similar style to Bonsai also originate from Japan too, but I understand that it is called Niwaki. Thank you Rosemary, I never knew what the name was for those type of trees. Was surprised to find that tree. Oh well, not as easy as we think. Eldest son used to do bonsai. It is a wonderful shape. Buen hallazgo, para hacer una estupenda toma. It is, nice to see on our travels. Was pleased to come across it Jo-Anne. I like the bonsai, although many people don't, they see it as tree torture, but there are places where bonsai happens naturally too. anyway, I'm curious about the markings on the rock to the right. It looks like a blanket stitched edge. Possibly growth marks for the tree? Bonsai is diffidently an art. I noticed those markings and can't tell from the photo what they are - if we go to same caravan park will have another look. I think someone may have made a mark on the stone! I must admit much as I am writing this from the land of many bonsai's my heart always bounces at the sight of palm trees it is so like I'm on a good holiday!! 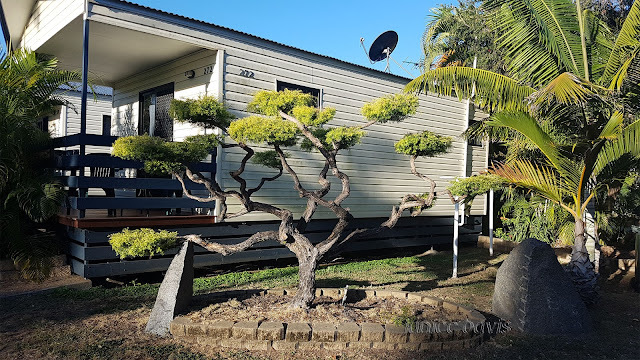 It has always been my dream to own a place with palm trees - I know, I know most people would be more impressed with a jolly nice bonsai in the front garden! Palm trees always seem to remind of a lot of us of an exotic holiday as the holiday TV advertising tells us. The bonsai tree is amazing - I've only seen bonsai plants in pots! I hardly think of bonsai as tree torture! on my porch............next time you can come up and clean up - ha ha! Enjoy the verbal garbage in the upcoming Tassie State Elections! You can clean up the Kookaburras muck! We don't see or hear that much about our election coming up - isn't that just wonderful, at least it's not thrown down our throats as the Americans have to torture. Interesting tree. Glad you had nice weather there. It must be fun what you do. Lovely weather it was Diane. Yes, we do love what we do. what delightful image of happy dancing tree ,loved it so much dear Margaret!! !